Republic of Ireland boss Martin O'Neill believes Uefa will have to intervene in the Danish dispute which could skew his team's Nations League group. O'Neill's side play their opener on Thursday in Cardiff against Wales, who could face a Denmark team of third-tier and futsal players on Sunday. Denmark's players body is in conflict with the national football association. "Uefa probably should [act] and will as well, if it develops in the direction it looks to be going," said O'Neill. "Uefa will have to make some sort of statement about it then. "If it does develop this way, there would certainly be a degree of unfairness about it. "We'll see how things develop. The situation might get resolved in the next couple of days and Denmark might be able to play their full-strength side." 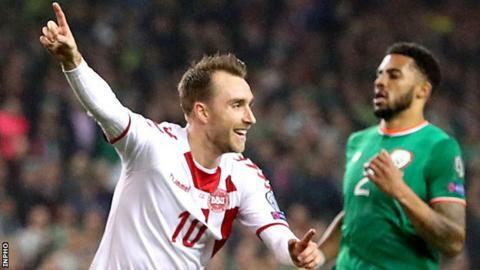 An under-strength Denmark squad were beaten 3-0 by Slovakia in a friendly on Wednesday after the first-choice players, including stars such as Christian Eriksen and Kasper Schmeichel, withdrew their labour. The dispute with the federation centres of the rights of players to make individual sponsorship agreements with companies competing with national team sponsors. O'Neill's under-strength Republic squad was further depleted on Wednesday as Preston midfielder Alan Browne was ruled out by a calf strain. Browne joins James McClean, Robbie Brady, James McCarthy, Scott Hogan and Shane Long on the casualty list. Bournemouth midfielder Harry Arter withdrew from the squad following a training ground row with assistant boss Roy Keane earlier this year while West Ham defender Declan Rice is also unavailable as he considers switching allegiance to England. Republic captain Seamus Coleman returns to competitive international action for the first time since suffering his horrific double leg break against Wales in a World Cup qualifier in Dublin 18 months ago. The Everton full-back insisted that he holds no grudges after the tackle by Neil Taylor which led to the Wales player being handed a straight red card. He said: "No, I'm looking forward to the game. That's 18 months ago, not that I've forgotten about it, but it's something from the past. "That night in Dublin is something that I'm not really thinking about."